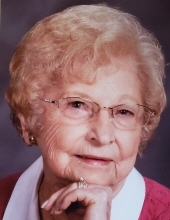 Ann White, age 101 of Washington Township, passed away March 31, 2019. Ann was very passionate about her faith, she was very active and was a leader at her Lutheran church in Imlay City. She enjoyed bowling, shopping, and playing cards with her family. She cherished spending time with her family. Loving mother of the late Judicia Ann (Michael) Hammer and Kenneth (Dian) Kotenko. ; beloved grandmother of Jeffrey Allan Clark, Glenn Michael Clark, Melissa Ann (James) Frommann, Kenneth (Laura) Allen Kotenko Jr., Kevin (Karen) Albert Kotenko, and Kristopher (Elizabeth) Alexander Kotenko; cherished great-grandmother of Emma, Abbey, William, Brandon, Cathryn, Logan, Kenneth III, Lillian, Alexander, Noelle and Juliana; dear sister of George (Pauline) Prokopenko, Irene (John) Birukow, Helen (Joe) Kotenko, John (Marian) Proko, Michael Prokopenko,; survived by Lena (Joe) Godoshian. Ann is also survived by many extended loved ones and friends. Donations can be made in Ann's name to the St. Peter Lutheran Church and School. To send flowers or a remembrance gift to the family of Ann White, please visit our Tribute Store. We will be meeting at the cemetery where prayers at the mausoleum will take place with burial to follow. "Email Address" would like to share the life celebration of Ann White. Click on the "link" to go to share a favorite memory or leave a condolence message for the family.